What can we conclude from this latest study of obedience as per St. Thomas Aquinas? That the combination of the sphere of authority and whether or not the order provided contains sin in the immediate or proximate case is supported. That authority has boundaries that are defined by some sort of law (Divine or otherwise). 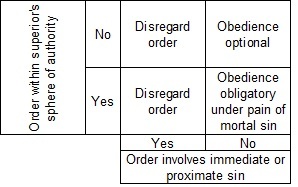 An order involving sin is to be disregarded. Obedience is optional for a non-sinful order outside the sphere of authority. Further, in looking at the example of the 1988 consecrations, there is an objective basis to assert that a state of necessity was in place at that time and required the Archbishop to perform the consecrations or face a dereliction of this duty. Finally, the application of good principles are key to acting with virtue in this crisis. Abandoning Catholic principles because one does not understand how to apply them is a wretched beginning that will lead to a person's undoing.